Remember that science experiment where you wired a potato to power a light bulb? 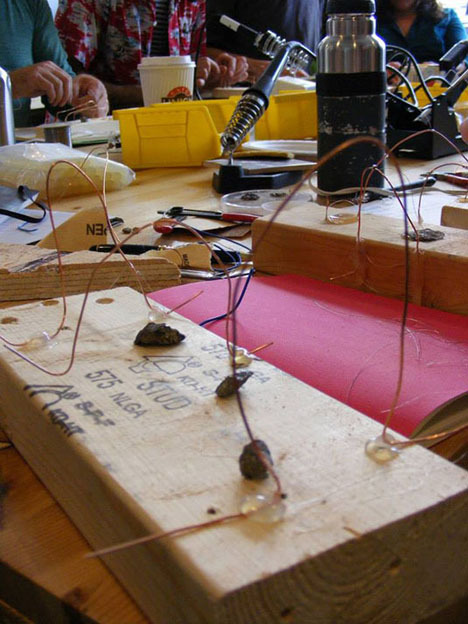 That was an example of how electricity can travel through everyday objects to perform unlikely tasks. Earlier this year, UK artist Ryan Jordan took it a step further when he ran a workshop in Montreal that used geological elements to make musical instruments. He rather pretentiously titled the project “Derelict Electronics,” a somewhat insensitive jab at what a homeless person might construct for musical instrumentation (something also apparent in the design of the ‘instruments’). Luckily, the underlying technological ideal is pretty cool. 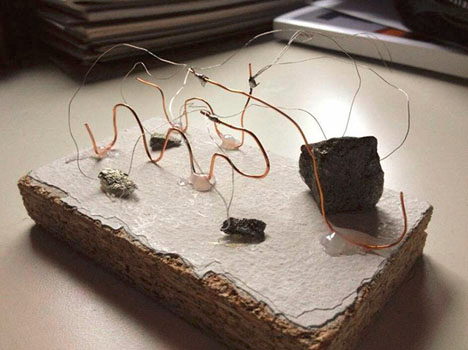 Jordan is showcasing the way electricity, and ultimately sound, travels through what most would regard as refuse. “When an electric current is sent through the rocks,” Jordan explains, “sporadic noise bursts from the speakers. 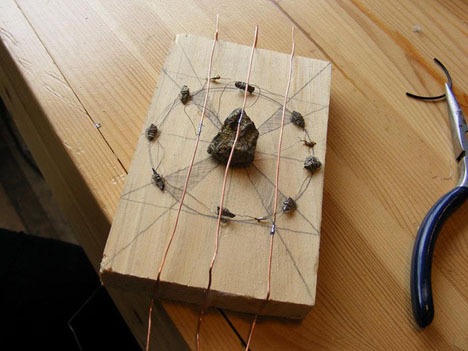 With some fine tuning these rocks begin to behave like microphones, amplifying howling feedback and detecting subtle scratches and disturbances in their surrounding environment.” Jordan based his premise on a 1933 experiment, the “Adams Crystal Amplifier,” which was an early version of the modern transistor. See more in Do It Yourself or under Technology. January, 2014.